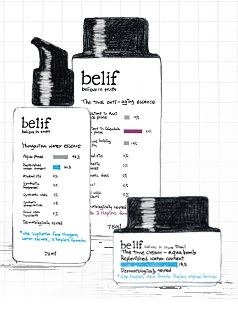 Introducing Brands | May our skin grow beautiful, as we grow wiser. We saw this brand on Sasa and it straight away struck our attention because it reminded us of IsQueen’s Rice Bran products which have had good reviews online. So we did a little investigation and came up with enough information to write this brand introduction. We love discovering new brands. Hakutsuru Sake Brewing Co., Ltd, located in Kobe, is a famous sake brewer of Nada, the best renowned sake-producing district in Japan. For more than two centuries, Hakutsuru Sake Brewing Co., Ltd. has been producing a wide range of sake, including draft sake, shochu, plum wine, nigori sake, etc. The Hakutsuru sake is a very popular Japanese sake brand, both within and outside of Japan. 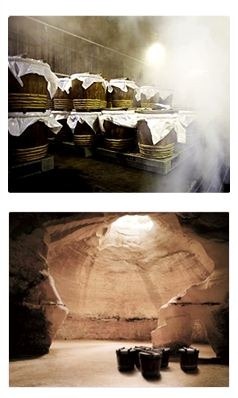 And since the 1950s, Nansen Trading has started bringing in and introduced the Hakutsuru sake to the Hong Kong market. 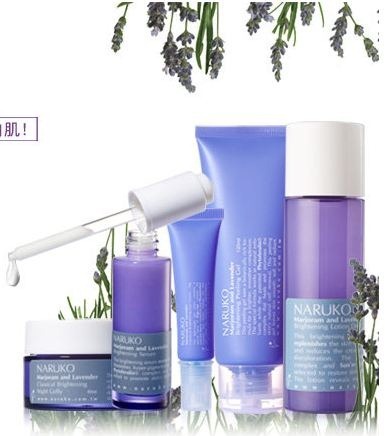 Since 2004, Hakutsuru Sake Brewing Co., Ltd. has started launching Rice Beauty, a line of gentle medicated skincare products that incorporate very familiar ingredients – the rice and water used in sake brewing. 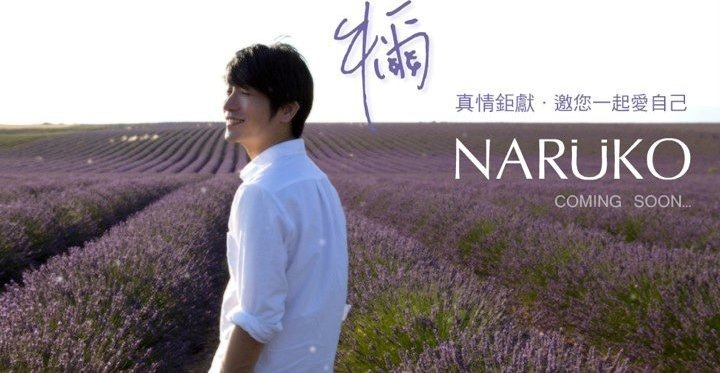 One of Korea’s biggest cosmetic company (after Amore Pacific) , LG Household ( same company that produces handphones, televisions ) has gone the organic natural way. 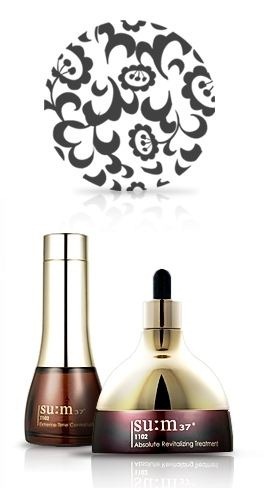 The powerhouse company that houses luxury brands like The History Of Whoo, OHUI, Isa Knox (for mature skin), Vonin ( men skincare brand ), Lacvert ( to fight Amore Pacific’s Laneige – brand for younger skin), Sooryehan ( The History of Whoo for younger skin – or also known as the cheaper History Of Whoo – for women in their 20-30s ) recently introduced a new herbal natural and organic brand named Belif – as interest in natural cosmetics is growing in Asia itself. Hope In A Blog’s first brand introduction : Su:m 37. Su:m 37 was introduced in 2007 by the LG Household Corporation (Yes, the same LG that does mobile phones, television etc) as a high-end premium line. 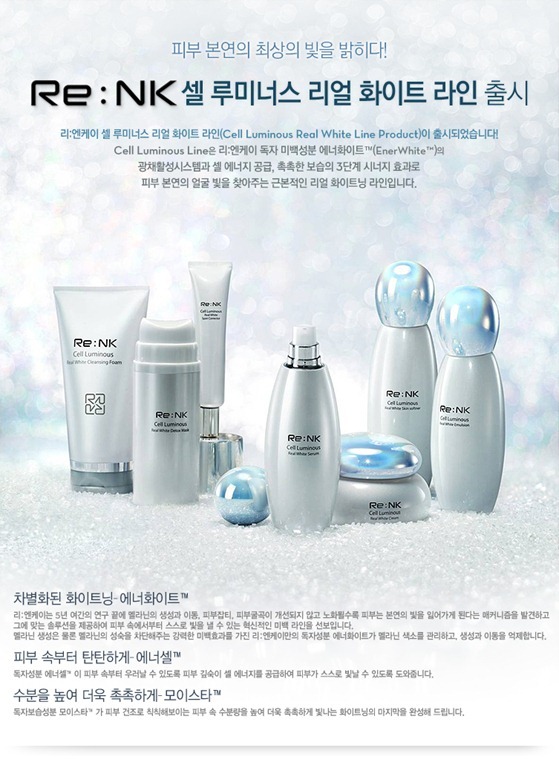 It now boasts 8 lines to it’s name and has become a fast uprising brand in Korea. 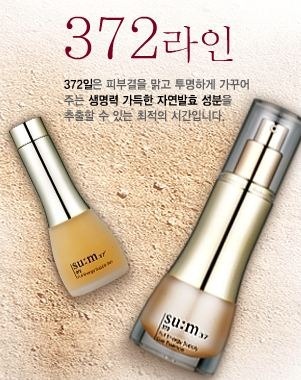 Meaning “respiration” in Korean, “su:m” refers to the skin’s respiration, while “37” represents the optimal temperature for fermentation. 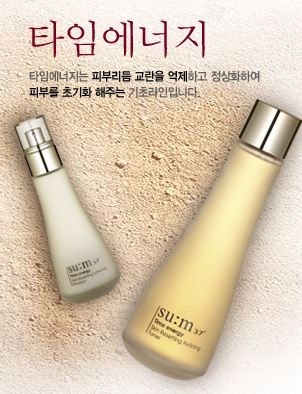 Therefore, the brand name “su:m 37” captures the science behind naturally fermented cosmetics. Sum37 products are free of fragrances, artificial colors, and synthetic preservatives. 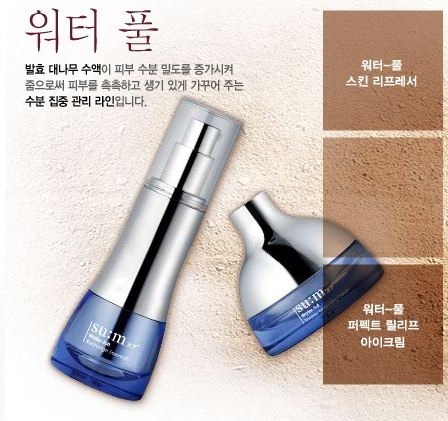 Believing in “fermentation cosmetics” as the next growth engine in the industry, LG H&H launched su:m 37, Korea’s first naturally fermented cosmetics brand. ▣ Full-scale department store marketing is to be initiated following its launch at the Daejeon Lotte Department Store in October, the Yeongdeungpo Lotte Department Store on November 30, and Busan Lotte Centum City in early December. LG H&H plans to enhance its brand position in high-end department stores by securing a presence in about 10 department stores by 2008. 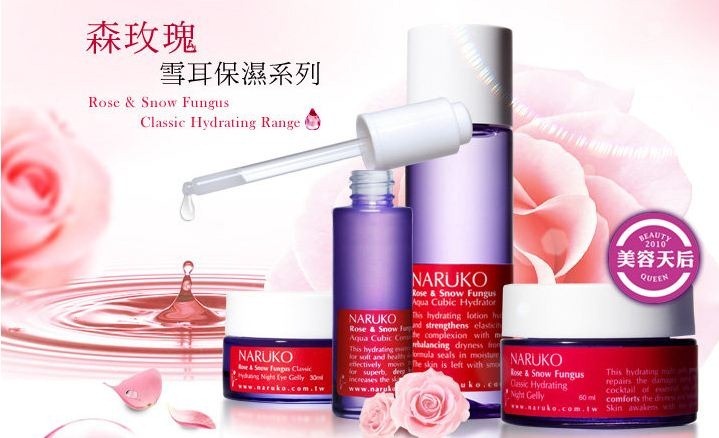 ▣ LG H&H believes that fermentation technology will be a new growth engine that can reinvigorate a Korean cosmetic market already saturated with Oriental medicine-based cosmetics. 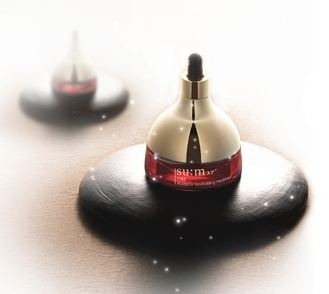 Known to many as the Korean equivalent to SK-II, SUm 37’s signature ingredient – extracts of 50 plant species developed through natural fermentation. 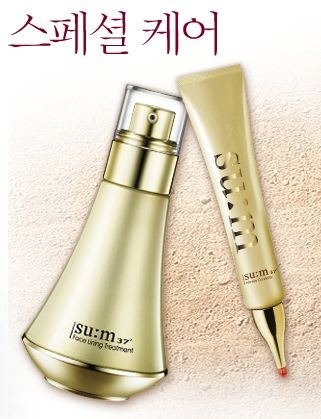 ▣ Meaning “respiration” in Korean, “su:m” refers to the skin’s respiration, while “37” represents the optimal temperature for fermentation. 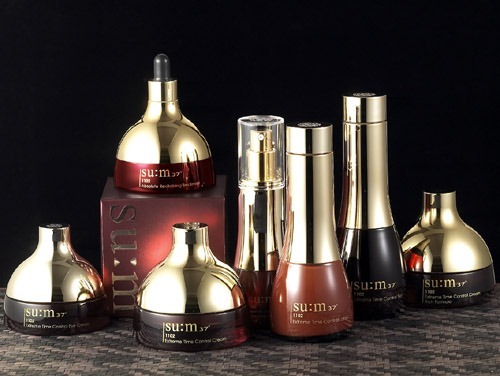 Therefore, the brand name “su:m 37” captures the science behind naturally fermented cosmetics. ▣ su:m 37 is created using a fermentation technique studied for about eight decades by Japan’s Otaka Research Center, renowned for its research in fermentation. 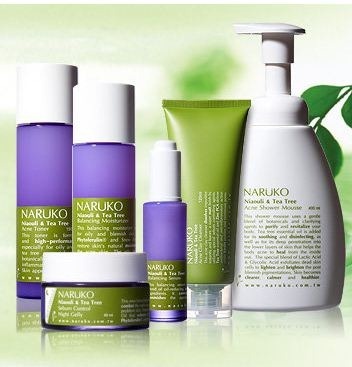 In the first step of this process, undiluted solutions of some 50 clean and pure plants are extracted and stored in a Japanese cedar keg in the Research Center for seven days. ▣ The extracted solution is moved to a storage area with a constant temperature of 37°C. It is left to breathe in tune with the melody of a music box while it is fermented dozens of times over three years. 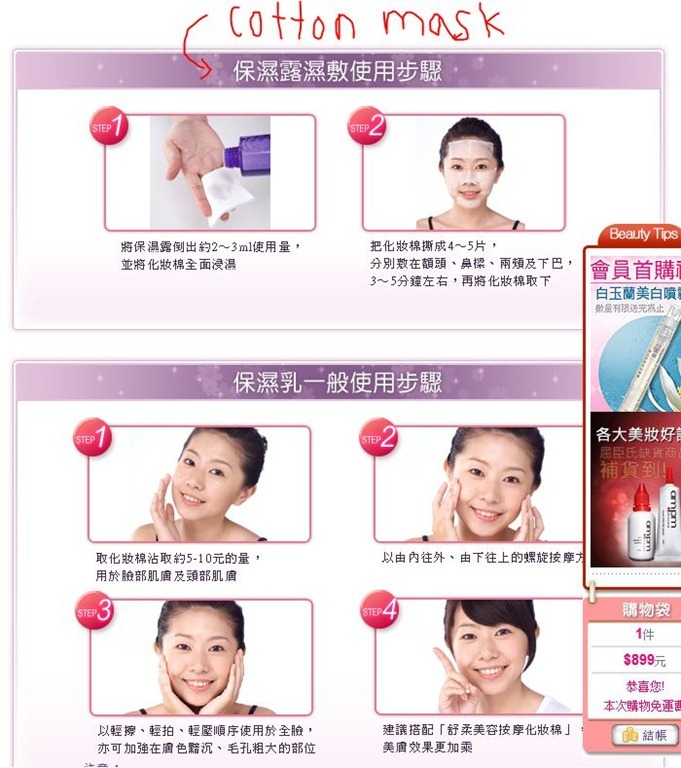 The process also produces new substances Zyen and Zyen-γ, which are highly effective at improving the skin. ▣ Zyen and Zyen-γ, naturally fermented substances, contain various amino acids, natural organic acids and antioxidants. 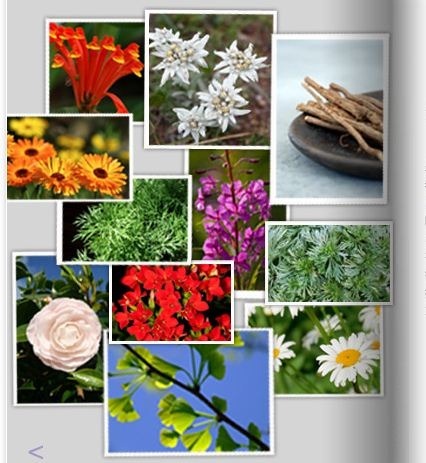 They do not irritate the skin and stimulate the skin’s metabolism. They help the skin appear healthy and smooth. The product containers’ attractive combination of luxurious golden tones and glass is designed by a leading French design firm echoes the shape of nature through Oriental simplicity and the beauty of flowing curved lines. 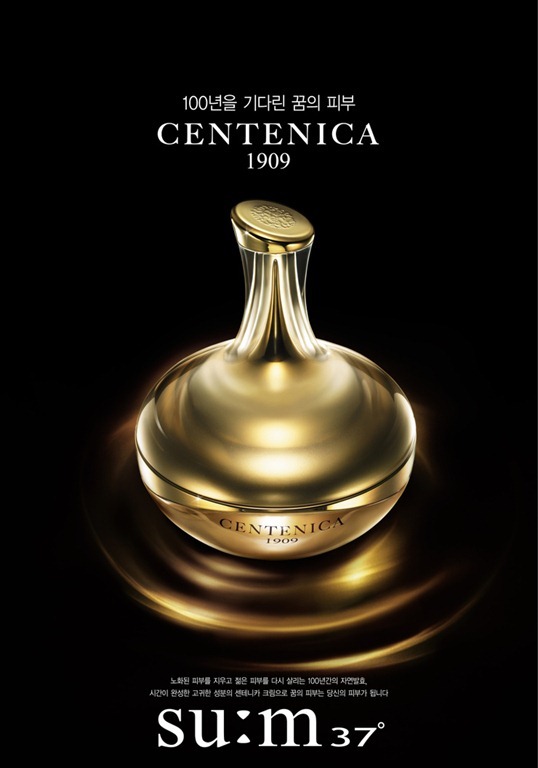 The most expensive line of Sum 37 is of course the Centenica 1909 Cream. 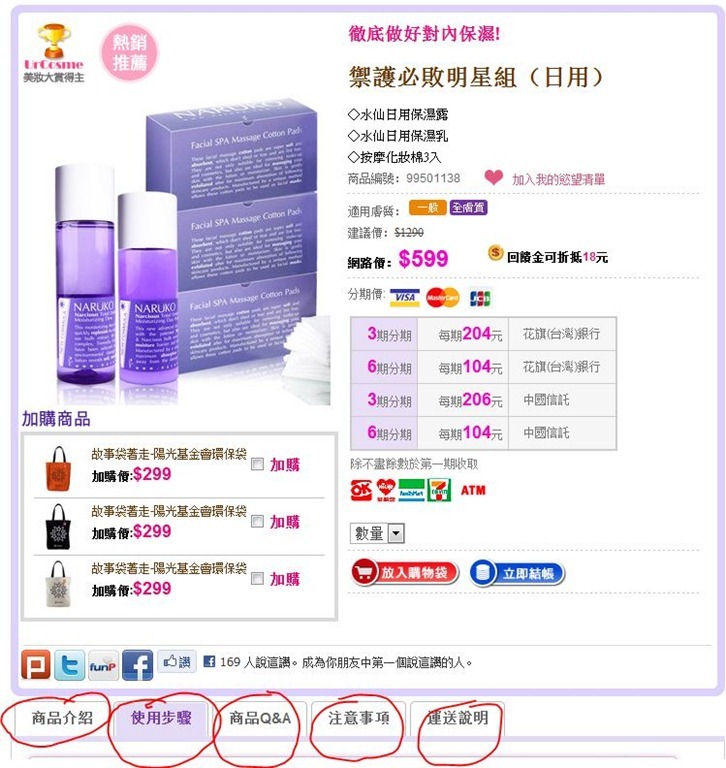 For 50ml, it retails for about 1000 $USD ! Contains only the best fermented ingredients in the world such as the famous Château d’Yquem wine, the balsamic vinegar of Modena (Aceto Balsamico Tradizionale) which is fermented for a minimum of 12 years, Ashwagandha or known also as Indian Ginseng, FOXO3 a human protein which is nicknamed the ‘longevity’ protein, and lots more goodies. 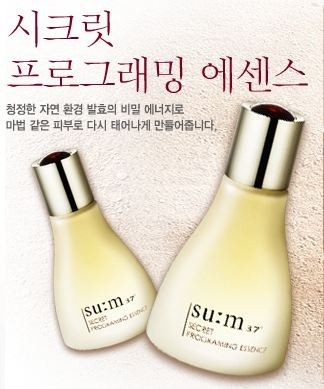 – Often compared to SKII’s famous essence, the secret programming essence is also the star product of SUM 37 and generated 70 billion korean won in sales after only 8 months and secured SUM 37’s position in the korean cosmetic market! 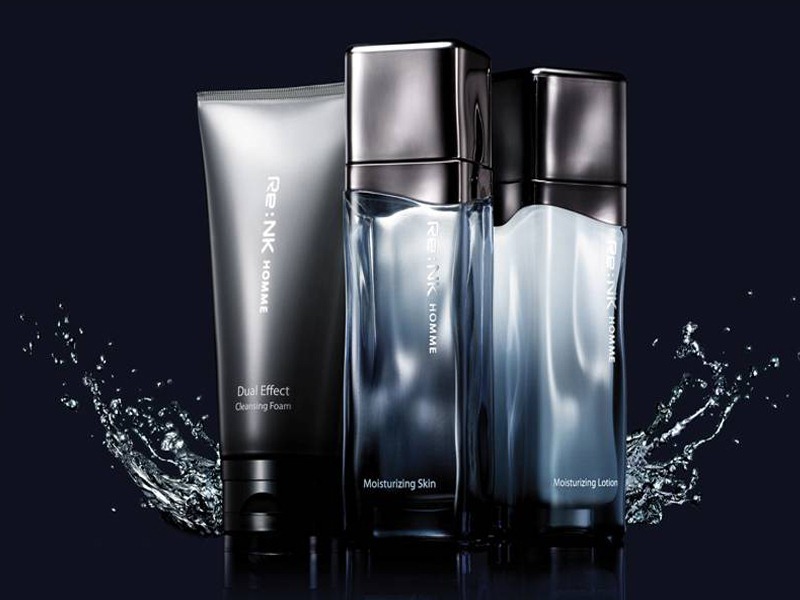 Every 3 minutes, 1 bottle is sold ! 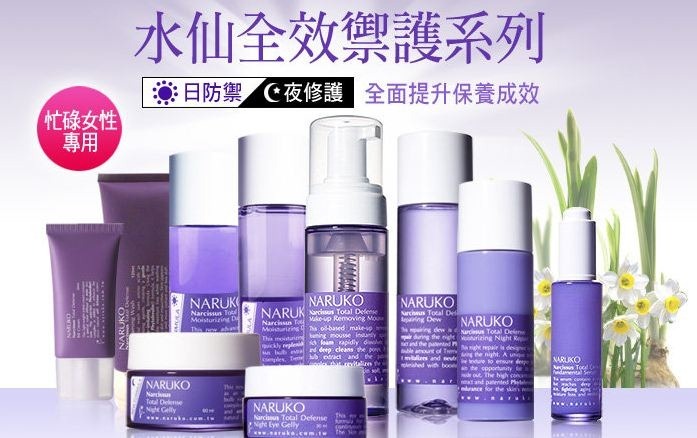 This essence is made out of 80 kind of plant extracts! 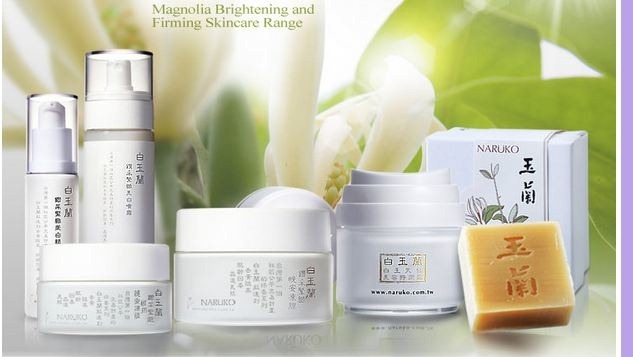 The 1102 line, which contains Zyen-γ produced over 1102 days of fermentation, is a basic skincare line that effectively lifts skin loosened due to aging. Enriched with polysaccharides, a third sugar, it adds density and vitality to skin.